Official 5 pack of replacement stylus tips for the Olixar HexStyli. Easy to fit to Olixar Hex. Pen. Always have stylus tips for your Olixar HexStyli stylus pen with this official stylus tip replacement pack. These tips exactly match your existing HexStyli stylus tips. 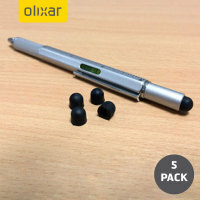 In this pack you get 5 replacement stylus tips, so you'll be covered for ages. Remove the current HexStyli Stylus Tip by placing your fingernails into the bottom of the rubber section of the stylus tip to grab hold of the screw and twist anti-clockwise to remove both the tip and the screw.